Many people claiming psychic and mediumistic ability have been shown to have been fraudulent. 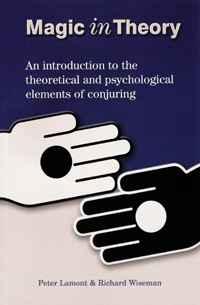 KPU research has explored the psychology involved in conjuring and deception. This work involved both developing a theoretical approach to these topics (Lamont & Wiseman, 1999; Lamont, 2006), and studying the specific methods employed by fake psychics (Roe, 1995). Related work has looked at the psychology of eyewitness testimony for demonstrations of magic trick and fake psychic ability. In one study, for example, participants were shown videotapes of a demonstration of fake metal bending and then asked to recall the demonstration. The results revealed that those who believed in the paranormal tended to misremember information about the method of the trick (Wiseman & Morris, 1995). Other research has examined how reports of the legendary Indian Rope Trick have become exaggerated over time (Wiseman & Lamont, 1996).